Whenever it is October, the entire educational system of the Philippines celebrate United Nations and the roads are quite filled with various flags that represent different countries. The United Nations (abbreviated UN in English, and ONU in French and Spanish), is an international organization whose stated aims are facilitating cooperation in international law, international security, economic development, social progress, human rights, and achievement of world peace. The UN was founded in 1945 after World War II to replace the League of Nations, to stop wars between countries, and to provide a platform for dialogue. It contains multiple subsidiary organizations to carry out its missions. The kids at home had to be on Saudi Arabia's and Singapore's national costumes. And, since the schools joined the United Nation Costume Competition in a local store here in General Santos City, you bet the venue was filled with kids on bright and interesting costumes and colors that could warm the judges' hearts. 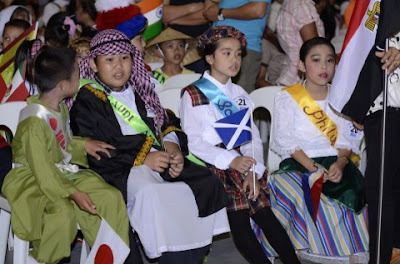 I am sure this ramp of national costumes of different countries sure fill the streets and center stages of schools.